We are based in Nottingham and have been established since 1985. We manufacture custom made furnishings for both contract and domestic markets. We operate a highly skilled and flexible production facility, producing bespoke sofas and chairs to the hotel, bar and leisure industry. 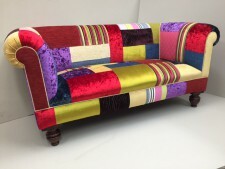 Luxury furniture manufactured to your individual requirements by our expert upholsterers. A comprehensive re-upholstery, repair and re-styling service to breathe life into your tired furniture. The ultimate mattress to guarantee a restful nights sleep. A complete curtain and soft furnishing service,including fabric padded walls from design to manufacture and installation.